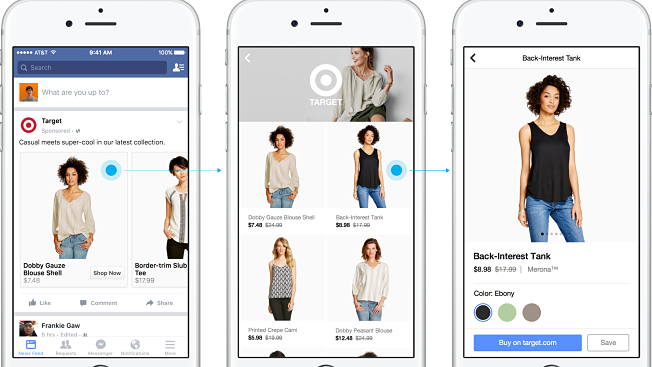 Can Facebook Attract More Retailers With New E-Commerce Features? Facebook wants marketers to see it as more than a branding platform. So, it's announcing two new tests today to that should pique retailers' interests—speedy landing pages and a new section that curates shoppable products. Back in June, Facebook started testing full-screen mobile ads with brands like Gatorade and Michael Kors. Now, it's experimenting with a version of the format, dubbed Canvas, that loads ads faster. Clicking on an ad in the News Feed pulls up a landing page with more information on a product. A second click-through directs people to shop from the retailer's site. The focus on full-screen, quick content is part of Facebook's bigger push to become a media and video hub for brands. The new ads are similar to Facebook's Instant Articles, which promises publishers and advertisers speedy text and pictures. 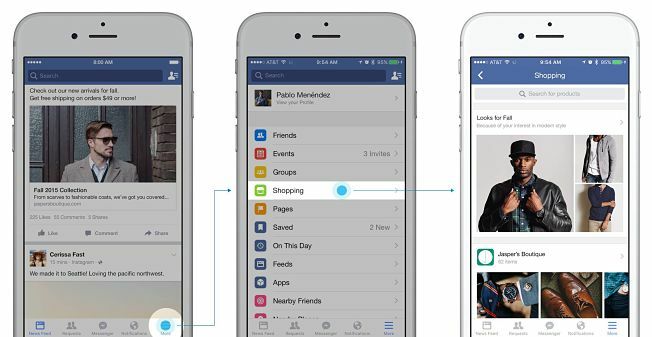 Facebook is also testing a new shopping section that pulls different products together under a tab in its app. The e-commerce hub builds on Facebook's Shop feature that rolled out last month to business Pages. Retailers participating in that program will be incorporated in the new shopping tab. Facebook also reports that its carousel ad format—the swipeable unit that stitches photos and videos together—has seen particularly strong results from retailers, lowering the cost per conversion 30 percent to 50 percent. Department store Neiman Marcus claims that carousel ads drove three times more conversions and 85 percent better click-through rates compared to its other advertising, although it's not clear what its other efforts entailed. Despite the heavy retail push, it's uncertain how e-commerce on Facebook will pan out for retailers, given the social network's rocky past, most noticeably with its failed Gifts program in 2012. In the past year, Facebook has tested "buy buttons" and added shopping features to its Messenger app to convince retailers that its platform works at driving sales, but Facebook has stiff competition from all the major social networks. Pinterest, Twitter and YouTube are also heavily pitching buy buttons to brands this year. Just in the past two weeks, Pinterest claimed to have 60 million Buyable Pins, and Twitter opened up its Buy button to new retailers including Best Buy and Adidas.